Torpedo maculopathy (TM) was first described by Roseman and Gass in 1992 as a rare, congenital anomaly of the retinal pigment epithelium (RPE) characterized by the appearance of a “torpedo-shaped” lesion located temporal to the fovea. A diagnosis of TM is made on the basis of its typical topography described as an oval-shaped solitary hypopigmented lesion, resembling a “bullet” or “torpedo,” with a wedge-shaped tail extending outward and pointing toward the foveola along the horizontal raphe. 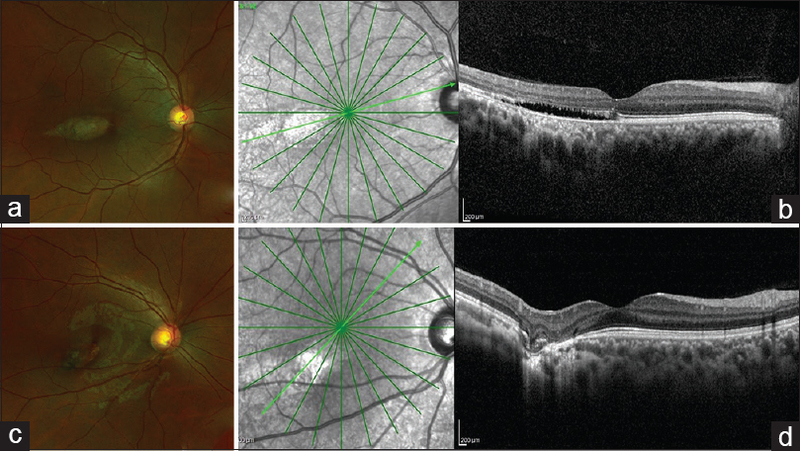 Multimodal imaging with color fundus photography (CF), optical coherence tomography (OCT), enface OCT, fundus autofluoroscence, and OCT angiography have confirmed the hypothesis that TM is a congenital abnormality of the RPE pigmentation and outer retinal layers. 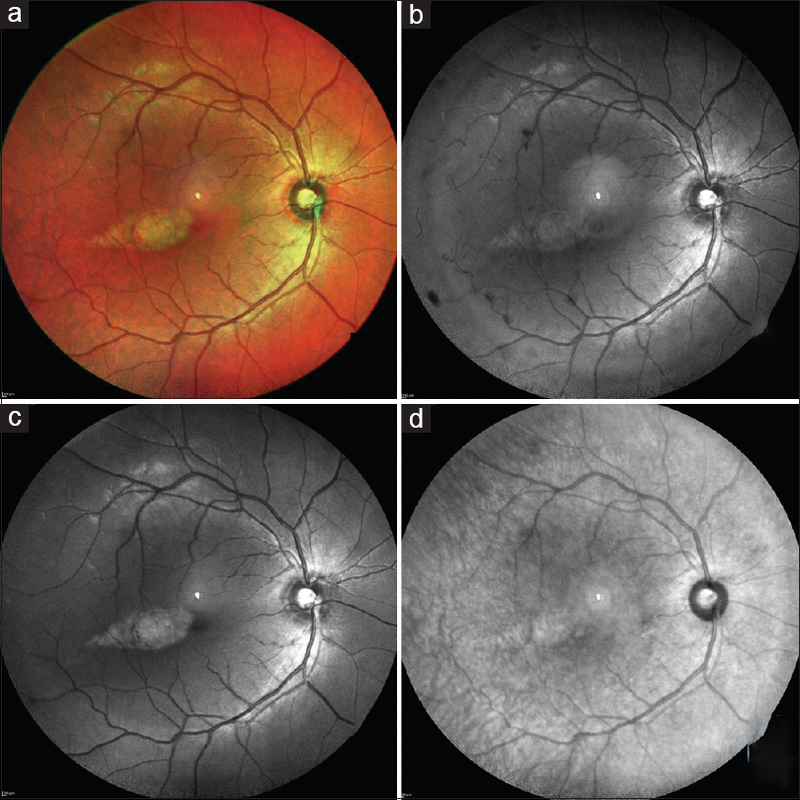 MultiColor (MC) scanning laser imaging is a new technology for fundus imaging, which offers detail and clarity not available with traditional fundus photography. The images are captured by simultaneously scanning with three individual laser wavelengths: blue (486 nm), green (518 nm), and infrared (815 nm). The different wavelengths penetrate the tissue to different depths, and therefore, provide structural information from different depths within the retina. In this report, we describe two cases of TM with MC imaging findings. A 37-year-old man, diagnosed previously as a “chorioretinal scar” in the macula, came for follow-up examination at our retina clinic. He had no ocular symptoms. Systemic history was normal. Eye examination revealed a visual acuity of 6/6 in both eyes. Anterior segment examination was normal in both eyes. Dilated fundus examination revealed pink and healthy optic nerves with normal physiologic cupping in each eye. Right eye macular examination revealed a classical, torpedo-shaped, hypopigmented chorioretinal lesion. Left eye macula was unremarkable. Peripheral retina was normal in both eyes. CF, OCT, and MC imaging was done [Figure 1]a and [Figure 1]b, [Figure 2]. Figure 1: Colour fundus and Optical coherence tomography findings in 2 cases of Torpedo maculopathy (a) Color image of macula in case 1 showing the torpedo shaped lesion temporal to fovea. (b) Optical coherence tomography (OCT) image showing the outer retinal cavitation with intact retinal pigment epithelium (RPE). (c) Case 2 showing the color image of macula with torpedo-shaped lesion temporal to fovea with pigmented area at the tail. (d) OCT revealing excavation of the inner retina, degeneration of the outer retina, thinning of the retina, and focal choroidal excavation (conforming type) with no subretinal cleft. Figure 2: Multicolour image findings in Torpedo maculopathy (case 1) (a) MC image of case 1 showing the torpedo shaped lesion temporal to fovea. (b-d) Blue (BR), green (GR) and infra-red (IR) reflectance images showing the torpedo lesion. The torpedo lesion is better delineated on the green reflectance image compared to infrared and blue reflectance images. A 23-year-old girl was referred by a general ophthalmologist to the retina clinic as a macular lesion in the right eye. She was asymptomatic and her systemic history was insignificant. Visual acuity was 6/6 in both eyes. Anterior segment examination was normal in both eyes. On dilated fundus examination, optic nerves were normal. Right eye macular examination revealed a torpedo-shaped, hypopigmented chorioretinal lesion with pigmented area at the tail. Multimodal imaging of the torpedo lesion with CF, OCT, and MC imaging was done [Figure 1]c and [Figure 1]d, [Figure 3]. On OCT (Heidelberg Spectralis HRA-OCT), there was an excavation of the inner surface of the retina corresponding to the area with pigmentation. Along the whole lesion, there was increased transmission of the signal. The outer retina including the IZ, EZ, and the external limiting membrane was disturbed, and the outer nuclear and plexiform layers were thinner at the depigmented nasal part of the lesion. At the area of retinal excavation, the retina was thin and retinal layers external to inner nuclear layer were not appreciated. Inner retinal layers showed no retinal thinning. A conforming focal choroidal excavation was noted along with an outer retinal defect overlying it. The choroid was very thin at the location of choroidal excavation. Left eye macula was unremarkable. Peripheral retina was normal in both eyes. In this report, for the first time, we describe the multicolor imaging findings of TM using the Spectralis spectral domain OCT (SD-OCT) (Heidelberg Engineering, Heidelberg, Germany). TM is a localized congenital abnormality of RPE pigmentation which leads to outer retinal and inner choroidal degeneration. Different imaging modalities have provided insights into the morphological and possible pathophysiological mechanisms associated with this lesion. Based on OCT, Wong et al. have classified the torpedo lesions into two types: 1) Type 1 – with attenuation of outer retinal structures and absence of outer retinal cavitation. 2) Type 2 – with presence of attenuated outer retinal structures and outer retinal cavitation with/without inner choroidal degeneration. Recently, Tripathy et al. proposed a new third type of TM on OCT. These include cases with excavated TM, retinal thinning, inner retinal hyper-reflective spaces, and no subretinal cleft. These three types of OCT findings represent the different levels of involvement of the same disease. According to this OCT classification, case 1 had type 2 TM whereas case 2 had type 3 TM in our series. Multicolor imaging uses three different laser wavelengths simultaneously to selectively capture different retinal structures from a single image during a single examination. The shorter wavelength blue laser provides details of the superficial retinal structures, the medium wavelength green laser provides details of the vascular structures whereas the longer infrared laser penetrates the deepest, providing information regarding the retinal pigment epithelium and the choroid. In our case 1, the torpedo lesion is well picked up on the green reflectance image and not so well delineated on the infrared reflectance image. This is due to the presence of intact RPE as seen on OCT. While in case 2, the torpedo lesion is well picked up on the infrared reflectance image and not properly picked up on the green reflectance image. In case 2, there was abnormality in the RPE and inner choroid as demonstrated by OCT. This explains the MC imaging findings seen in case 2. In conclusion, MC imaging can be a useful tool in identifying the level of retinal and choroidal layer involvement in TM. 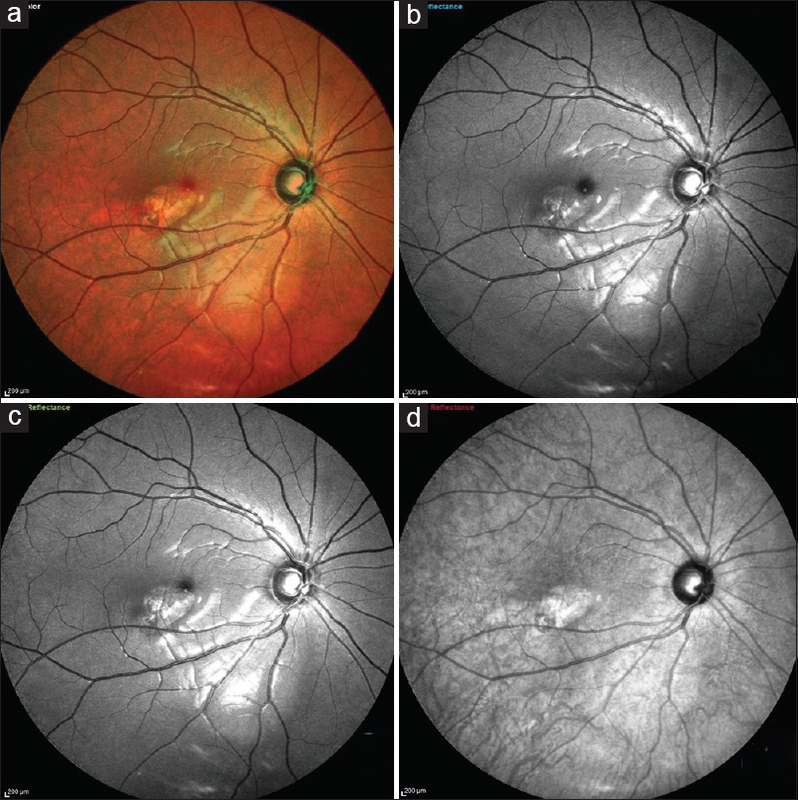 MC imaging further confirms the hypothesis that TM is a localized congenital abnormality of RPE pigmentation which leads to outer retinal and inner choroidal degeneration. It is not clear whether the choroidal changes seen in TM are a late-onset phenomenon to the retinal malformation or whether they are a part of the primary event. Trevino R, Kiani S, Raveendranathan P. The expanding clinical spectrum of TM. Optom Vis Sci 2014;91:S71-8. Papastefanou VP, Vázquez-Alfageme C, Keane PA, Sagoo MS. Multimodality imaging of torpedo maculopathy with swept-source, en face optical coherence tomography and optical coherence tomography angiography. Retin Cases Brief Rep 2018;12:153-7. Tan AC, Fleckenstein M, Schmitz-Valckenberg S, Holz FG. Clinical application of multicolor imaging technology. Ophthalmologica 2016;236:8-18. Wong EN, Fraser-Bell S, Hunyor AP, Chen FK. Novel optical coherence tomography classification of TM. Clin Exp Ophthalmol 2015;43:342-8. Tripathy K, Sarma B, Mazumdar S. Commentary: Inner retinal excavation in torpedo maculopathy and proposed type 3 lesions in optical coherence tomography. Indian J Ophthalmol 2018;66:1213-4.